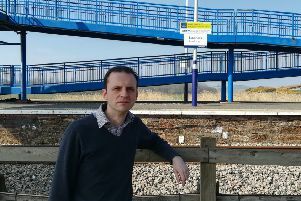 A Fife entrepreneur has developed the UK’s first sleeper mini-coach, which could transform overnight travel for groups of holidaymakers, as well as tour bands and university and school trips. Alan Aim, a former tour guide who runs Cowdenbeath-based coach hire company Travel by Knight, has had the vehicle custom-built to include 12 sleeping berths for long-distance journeys. The coach even has a trailer. The Mercedes-Benz Sprinter 516 conversion made its debut journey from Aberdeen to Edinburgh’s Sleep in the Park on Saturday – transporting two groups of fundraisers who collectively raised more than £6000 to help end homelessness in Scotland. It is fitted with multiple sockets and charging points, as well as a microwave and other mod cons including air conditioning. The mini-coach even offers its guests breakfast, including bottles of juice and water, as well as toiletries, in the morning to help them freshen up. It can sleep up to 12 people, pull a trailer full of luggage or music equipment, and offers travellers the option to combine travel and accommodation costs, as well as ‘Save their Day with Travel by Knight’. Alan said: “The latest addition to our fleet is a mini-coach with a difference. It’s fitted with 12 berths, each designed in a ‘reclining’ position instead of flat, so that more can be fitted in. Each berth has draw curtains, a magazine rack, a reading light, and a mobile phone USB charger port. “Travel by Knight only offers private hires, which are ideal for small groups looking to travel long-distance in the UK overnight. We can offer a great alternative to spending spend six to 10 hours a day on the coach travelling, as well as many other transport and accommodation arrangements. “The ultimate goal is to have a network of sleeper buses, connecting Glasgow all the way to Beijing – a sort of Trans-Siberian journey, but on tyres.